Civil War Songs and Stories is scheduled to air May 18 and 27 on Nashville's PBS station, WNPT. The program is produced by the award winning multimedia team at the Renaissance Center, which has partnered with NPT to develop a series of documentaries to mark the 150th anniversary of the Civil War. The one-hour special highlights the stories behind the songs and the emotional impact music had on soldiers and families before, during and after the conflict. Actor David Keith, a native Tennessean, narrates the documentary. From pride and patriotism to death and defeat, the documentary explains how music was as much a part of Army life as a musket. The narrative explains how both sides were accompanied by professional regimental brass bands mustered to preserve morale. The music inspired soldiers and consoled them. It brought memories from home and gave hope to what would soon seem to be hopeless circumstances. The program features modern performances by such artists as Crystal Gayle. American Idol sensation Bo Bice. the Fisk Jubilee Singers and Irish Folk Singer Maura O’Connell. William Lee Golden of the Oak Ridge Boys and Jimmy Fortune of the Statler Brothers sing "Dixie" and "Battle Hymn of the Republic." 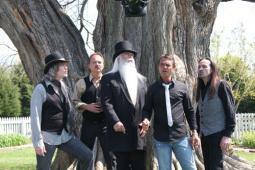 They are joined by bass singer, Tim Duncan, Chris Golden (William Lee's son) and Jimmy Fulbright. Other artists contributing to the project are Don and Katy King, Les Kerr, Elizabeth Foster, the Princely Players and pianist, Jeff Martin. The air time for the program is 7 p.m. on both May 18th and May 27th. For more information on the documentary, please visit wnpt.net. For more information on Tennessee Civil War Sesquicentennial events, please visit tncivilwar150.com.